Published: Dec. 21, 2013 at 06:44 p.m. Updated: Dec. 21, 2013 at 06:51 p.m.
Connor Halliday passed for 410 yards and six TDs, but the Cougars blew a 15-point lead to Colorado State. 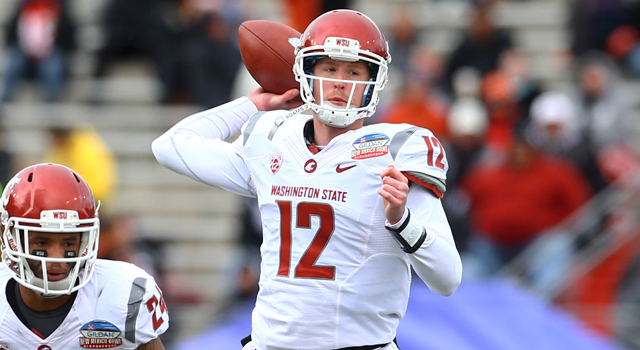 Washington State junior quarterback Connor Halliday has set the bar high for other quarterbacks during the postseason. It's just too bad for Halliday he did it in a loss. Halliday's second pass of the day was an interception, but he rebounded to throw for 410 yards and six touchdowns -- to six receivers. However, Washington State improbably blew a 15-point lead in the final three minutes and lost 48-45 to Colorado State in the New Mexico Bowl. Washington State fumbled the last two times it touched the ball. The first set up Colorado State's game-tying touchdown. The second came on the ensuing kickoff and set up a last-play game-winning field goal. Halliday went into the game tied for third in the Pac-12 with 28 touchdown passes, a figure that also ranked 13th nationally. Alas, he also entered the game with 21 interceptions, five more than anyone else in the nation. That's the issue with Halliday: While he is a productive passer, throwing for 4,597 yards this season, a figure that should be enough for him to finish third nationally in that category, he makes a ton of careless throws. At 6-foot-4, Halliday has good size, but he weighs just 190 pounds and needs to put on some weight. Yes, he plays for Mike Leach and is a system quarterback, but he has enough of a skill-set to head into his senior season as a potential third-day pick. He won't realize that potential, however, unless he cuts down -- way down -- on his mistakes.